A person on a moving ship drops a rock. They see it fall straight down to land at their feet. Someone on shore sees the rock continue to move horizontally as it falls, and says the trajectory is parabolic. Another observer on another ship sees it move horizontally with a different speed and sees a different parabola. They all see it land at the same time. Galileo concluded that the horizontal motion cannot influence the vertical motion, and that what takes place on the ship is independent of the ship’s motion. Galileo argued this applies to all physical and biological processes. The same principle applies to what takes place on a moving Earth. A person on a ship drops a rock. To that person its trajectory is a straight line. An observer on shore sees the trajectory as a parabola. Someone on another ship sees yet a different parabola. All of them are making valid observations. They all see it land at the same time. Galileo concluded that the vertical motion of the rock must in principle be independent of its horizontal motion. Furthermore he concluded that everything that happens on board the ship must be independent of its motion. He argued that whatever you take with you on the ship, insects, fish, physics experiments, etc will be unable to detect the horizontal motion of the ship. He was assuming, of course, that this motion is perfectly uniform and smooth. This is called the Galilean principle of relativity and explains immediately why we do not sense the motion of the Earth about the Sun. A concave vessel for drinking from, usually made of opaque material. A trophy in the shape of an oversized cup. A contest for which a cup is awarded. One of the two parts of a brassiere which each cover a breast, used as a measurement of size. A US unit of liquid measure equal to 8 fluid ounces, 1/16 of a US gallon, or 236.5882365 ml. A suit of the minor arcana in tarot, or one of the cards from the suit. In mathematics, a symbol denoting union and similar operations. In medicine, a flexible concave membrane used to temporarily attach a handle or hook to a flat surface by means of suction. In US sports, rigid concave protective covering for the male genitalia. In golf, a cup-shaped object placed in the target hole. In ultimate frisbee, a defensive style characterized by a three player near defence cupping the thrower, or those three players. 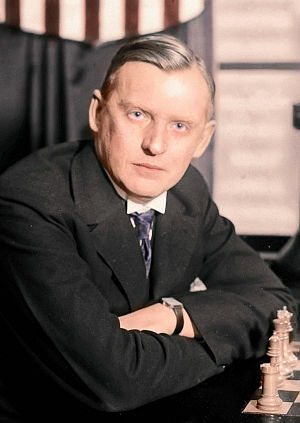 Alekhine’s gun is a formation in chess named after the former Russian World Chess Champion, Alexander Alekhine. This formation was named after a game he played against another illustrious Latvian Grandmaster, Aaron Nimzowitsch in San Remo, Italy, 1930, ending with Alekhine’s victory. The idea consists of placing the two rooks stacked one behind another and the queen at the rear. This can lead to massive damage to the opponent as it usually marks the beginning of the final assault (in Nimzowitsch’s case it was only four moves before his resignation). In very rare cases it can be two queens and one rook on the same file. Six years later, in 1936, William Winter was defeated by Alekhine in Nottingham, who used Alekhine’s gun again to secure the victory. Since then, chess players have learned much about using and guarding against this formation. However, some international games are still lost and won by the force of this classic chess tactic. A bullet fired horizontally from a gun, and a second bullet dropped by hand from the same height as the gun, will both hit the ground at the same time. The forward motion of an object has no effect on the pull of gravity. At ancient Roman dinner parties, a live mullet would be brought in a jar from the kitchen, and the water removed. When dying, mullet change colour like a traffic light, going red, orange and green. Having amused the guests in this way, the fish would be returned to the kitchen to be cooked. Edward VII’s idea of a good time was to drop half-sucked pear drops into the pockets of his houseguests. On the 26th of May 1868, the last public execution in Britain – the hanging of murderer Michael Barrett – took place at Newgate. In 1883, Sitting Bull was invited as guest of honour to address a celebration of the completion of the Northern Pacific Railway. Speaking in Sioux through a translator, his speech began: “I hate all white people. You are thieves and liars”. 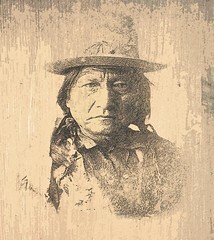 The interpreter, taken by surprise, hastily improvised a string of flowery compliments in English, with the result that the speech was greeted with rapturous applause, much to Sitting Bull’s amusement. Avernus or Lago d’Averno is a lake of Campania, Italy. To be more precise, it is an old volcanic crater 2 km (1.2 mi) in circumference which has been filled with water at least since Roman times. In ancient times it was surrounded by dense forests, and was the centre of many legends. It was represented as the entrance by which both Odysseus and Aeneas descended to the infernal regions, the entrance to Hades. It was also thought to be the abode of the Cimmerii – an ancient people of the far north or west of Europe, first spoken of by Homer who describes them as living in perpetual darkness. It was also believed that all birds flying over lake Avernus were destined to fall dead because of the toxic fumes that mouths of the crater gave off into the atmosphere. It is unclear whether the lake actually was as deadly as its reputation held it to be – it certainly holds no fears for birds today. Despite the alleged dangers of the lake, the Romans were happy to settle its shores, on which villas and vineyards were established. In fact, general Hannibal visited the lake in 214 BC. The lake was owned by the Bourbon rulers of Naples and ceded in 1750 to an aristocratic family which sold up in 1991 to the Cardillo family. 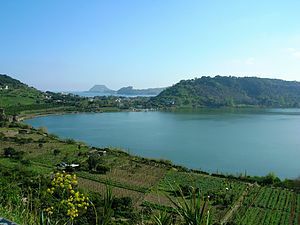 In 2010 the lake was confiscated by the police after the owner was accused of being a mafia frontman. The custom that flourished, especially during the sixteenth and seventeenth centuries, by which a pope would name as his chief minister and most important advisor a nephew or similar relative who was elevated to the rank of cardinal and thereafter oversaw many of the most vital elements of papal administration. The practice was not invented in the sixteenth century, as papal nepotism had long been an established part of the pontifical court. 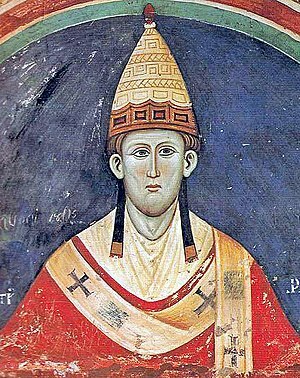 Pope Adrian IV (1154-1159), for example, named his nephew Boso to the cardinalate and put him in charge of Castel Sant’Angelo. Throughout the Middle Ages, it was common for a pope from one of the leading noble families to promote the interests of his house, but nepotism began reaching absurd heights toward the end of the fifteenth century with the accession of Alfonso de Borja y Borja as Callistus III (1455-1458). He made two nephews cardinals and worked to assist other family members with such vigor that at his death, the Aragonese who had profited from his generosity were driven from Rome. One nephew, Rodrigo Borgia, became Pope Alexander VI (1492-1503). He made his son Cesare Borgia a cardinal and surrendered to him vast powers over papal policy. Cardinal-nephew could be young chaps; in 1545, Ranuccio Farnese was made cardinal by Paul III at the age of 15. The cardinal nephew in later years developed out of the need for the pope, usually old at the time of his election, to be assisted in the demands of office by a younger and more energetic assistant. Given the climate of intrigue that often pervaded Roman society in the period, the pope regularly turned to a promising young nephew, as relatives were slightly more reliable than scheming prelates who might be anxious to replace the reigning pontiff. As a brother to Leo XIII, Giuseppe Pecci became the last cardinal-nephew to date in 1879. The practise seems to have died out.